EP finds that the U.S. is at moderate to very high risk of losing 71.5 GW of nuclear energy between today and 2030, and is likely or very likely to add 2 GW of new nuclear by 2030. The U.S. generated 806 terawatt-hours (TWh, net) of nuclear electricity in 2017, nearing the historic peak of 807 TWh of nuclear generation in 2010, and a 4.5 percent change from the recent historic low of 770 TWh in 2012. It would take 12 years to replace the 120 billion kilowatt-hours of yearly production from the eleven at-risk nuclear plants with wind and solar, and 81 years to replace the entire reactor fleet. 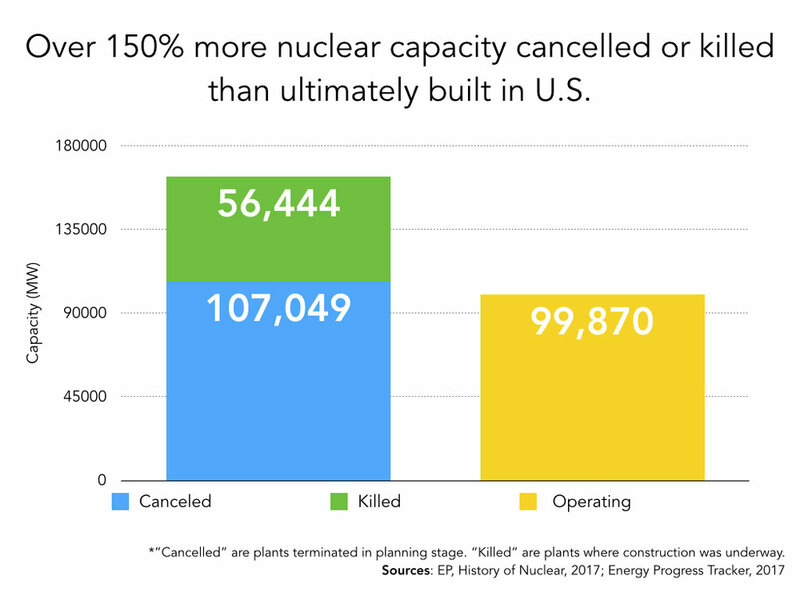 Over 150% more nuclear capacity has been cancelled or killed than ultimately built in the United States. In July 2017, utilities announced their decision to halt construction of the twin-reactor V.C. Summer project in South Carolina. The two nuclear reactors would generate 18 terawatt hours (TWh) of electricity annually, replacing 86 percent of South Carolina’s electricity from coal. Dozens of climate scientists and conservationists urged former president Barack Obama to do everything in his power to protect and expand America's largest source of clean energy. They have also written to President Donald Trump and the leaders of large environmental organizations.